In order to accept payments via PayPal, you need to set up a PayPal Standard Business Account. If you set up a "Standard Business Account" with PayPal, you may accept payments via credit card or via the person's PayPal account. If you create a Standard Business Account, there are no monthly fees. A transaction fee will be added to each transaction. The higher your monthly payments, the lower your percentage rate. To learn more about PayPal price, click here. The first step towards managing PayPal payments via Farmigo is to create a PayPal account for your business. To get started, all you need is a PayPal Business Standard account. If you already have a PayPayl Business Pro account, it will also be compatible with Farmigo. View the slide show below to review the entire sign-up process; then read on below to learn how to set up PayPal to work with Farmigo. 1. Login to your dashboard and click on Settings --> Advanced --> Payments. 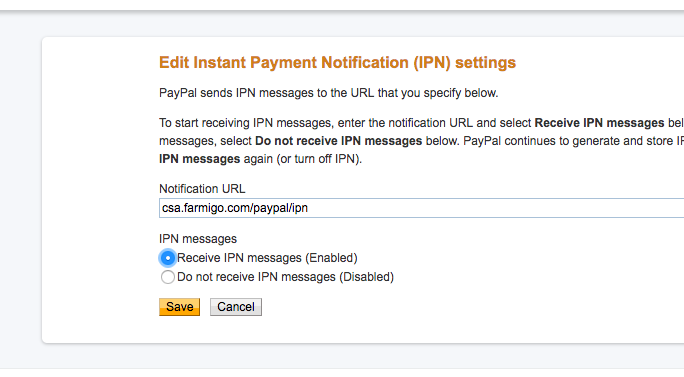 Follow the steps below to enable Instant Payment Notification in your PayPal account. Follow the slideshow for a step-by-step view. Go to "Settings" -> "Website Payments" --> "Instant Payment Notification"
Click the link to Update, then click the button to "Choose PIN Settings"
Check the "Receive IPN messages (Enabled)" radio button and click "save"